Robert and Dotty Mittelstadt purchased the Anderson Funeral Home, located at 209 N. Washington Street in Lake Mills, IA, from Arnold Anderson, Jr. on October 1, 1960. Prior to that, the business was owned by Arnold Anderson, Sr. and was located on North Mill Street in Lake Mills, then it was purchased by his son, Arnold, Jr.
Robert and Dotty, together, owned and operated the funeral home for thirty years until illness prompted them to sell the business. 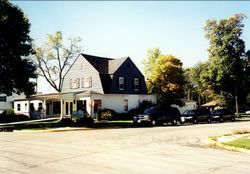 Bart Winter purchased the funeral home from the Mittelstadts on May 1, 1990. Both Robert and Dotty continued working with Bart until Robert died in November 1992. Dotty remained active at the funeral home and helped in countless ways until retiring and moving to Newton, Iowa, to be closer to her family in May of 2005. Our current facility was built at 902 East Main Street in Lake Mills, and opened it’s doors on August 1, 2002.